The launch of the Government’s flagship database of every child living in England has been delayed just days after The Daily Telegraph exposed serious concerns about its purpose. ContactPoint will include the names, ages and addresses of all 11 million under-18s in the country, as well as detailed information on their parents, GPs and schools. It was announced in the wake of the murder of Victoria Climbi� as a way to protect children by connecting the different services dealing with them, but this newspaper discovered that it will actually be used by police to hunt for evidence of crime. The �224million computer system was meant to come into operation in April 2008 but was delayed following the loss of data discs containing 25 million child benefit records by HM Revenue & Customs last year, which triggered fears that ContactPoint records could easily find their way into the hands of paedophiles. A review of its security – which the Government refused to publish in full – found the risk of a data breach could never be eliminated and the launch of ContactPoint was pushed back to October. Now, just weeks before its planned launch and days after the Telegraph disclosed concerns that it will be used to increase the criminalisation and surveillance of England’s youth, ministers have announced that ContactPoint will not become operational until the New Year at the earliest. The Department for Children, Schools and Families claimed that the new delay was not down to security or privacy fears, however, but simply because of “glitches” that had emerged during testing of the system, which is being built by the IT firm CapGemini. The children’s minister, Kevin Brennan, told fellow MPs: “We have identified some issues as a result of recent system tests which we are working urgently to address. However opposition MPs said the Government should now take the opportunity to scrap the whole project. The Shadow Families Minister, Maria Miller, said: “We repeatedly warned the Government of the problems with ContactPoint but they pressed ahead regardless, ignoring our calls to allow time to sort them out. The Liberal Democrats’ Shadow Children, Schools and Families Secretary, David Laws, added: “Instead of delaying the launch of the database, this intrusive project must be scrapped altogether. “A recent independent review has already undermined all of the Government’s assurances that the database will be secure. The discovery of further technical issues does not bode well for the future. Of course, ContactPoint should be scrapped entirely, and readers of BLOGDIAL know the reasons why. If it is scrapped, (and it should be because ContactPoint can never be made secure) then the same reasons why it is being scrapped will apply to the rationale behind scrapping of the NIR and the ID Card. No database can ever be secured. Once the data gets out, it is out forever. Internal leaks are a great hazard, and most of the biggest data escapes have been from this source, like the DVDR posted in the post and LOST, containing the personal details of 25 million children and parents. This submission has a good summary of these risks, and why databases can never be secured. The fact of the matter is if children need to be protected from paedophiles by not implementing ContactPoint, then the rest of the population should also be protected from identity thieves, stalkers, rapists, and every other sort of criminal that will be willing to pay millions for access to the NIR data. Of course, all of these correct objections are completely separate from the moral objections that are to do with children not being the property of the state, privacy, liberty and all the rest. ContactPoint is part of the irrational mania for registers that computer illiterate ministers are suffering from which threatens to plunge Britain into an abyss of unprecedented blackness and horror. I am getting a sense that this is a step too far for the mild mannered, infinitely patient Great British Public™; that the reaction of the public has been violently antagonistic to ContactPoint, and ministers have been feeling the incandescent rage of anyone they encounter who knows about this abominable system. Even a rabid dog knows when to turn tail and flee when it is confronted by its own destruction, and it may be the case that Neu Labor is that rabid dog when it comes to ContactPoint. It should not be long before the same reasoning is applied to the NIR and ID Cards and then the whole identity sham will come down on them. In the Queen’s speech this autumn Gordon Brown’s government will announce a scheme to institute a database of every telephone call, email, and act of online usage by every resident of the UK. It will propose that this information will be gathered, stored, and “made accessible” to the security and law enforcement agencies, local councils, and “other public bodies”. This fact should be in equal parts incredible and nauseating. It is certainly enraging and despicable. Not even George Orwell in his most febrile moments could have envisaged a world in which every citizen could be so thoroughly monitored every moment of the day, spied upon, eavesdropped, watched, tracked, followed by CCTV cameras, recorded and scrutinised. Our words and web searches, our messages and intimacies, are to be stored and made available to the police, the spooks, the local council � the local council! � and “other public bodies”. This Orwellian nightmare, additionally, is proposed for a world in which leading soi-disant liberal democracies run, and/or permit rendition flights to, Guantanamo Bay. How many steps separate an innocent British citizen from some misinterpretation or interference or error in the collected and ‘made accessible’ data of text messages and emails, and a forthcoming home-grown version of Guantanamo Bay for people whose pattern of phone calls does not fit the police definition of acceptable? The second point concerns the quality of our politicians. They say they are putting us all under suspicion for our own good. They wish to protect us against terrorists and criminals, and to make bureaucracy more efficient. The efficiency of bureaucracy has one of its finest moments in the neat and sorted piles of false teeth, hair and spectacles at the gas chamber doors. Oh no: better the milling crowd than the police-disciplined queues of bureaucratic efficiency; better the irritation of dealing with human fallibility than the fear of dealing with jack-booted gendarmes whose grip on one’s arms follows stepping out of the queue. But as to the first matter: protecting us � by making us all suspects, all potential criminals and terrorists � from terrorism and criminality. Well: the first duty of our politicians should be to protect our liberties, and to encourage us to see that liberty carries risks, which we should be trusted to understand and accept so that we can make our own lives our own way. But no: these politicians � Brown and Labour, once the party of the people � are going to keep us safe by not keeping our liberties safe; they are going to keep us safe by making us unfree. Yet the putative benefit of protecting us from terrorism and crime is unattainable. They themselves say ‘there is no 100% guarantee of safety’: but they are going to spy on us all anyway! In fact they are going to create crime: a huge new criminal industry awaits for stealing, copying, falsely creating and manipulating that newly-created precious commodity, “identity”. A huge new impetus awaits for techno-crime to disrupt the monitoring and data storage systems on which the government intends to spend billions of our tax money, creating its unblinking eye in our bedrooms. As surely as night follows day, the new surveillance society will do more harm than good. We have been saying this for almost a decade, and with all the technical facts included. We are far ahead of AC Grayling and all the others who write in these newspapers, and have been for many years. What none of these people want to face is the fact that government will NEVER bestow (or in this case, return) freedom on its citizens. If AC Grayling wants his civil liberties back, he is going to have to become uncivil to a very distasteful degree. The potential for profoundly negative uses of technology has escaped us. It is with despair that I conclude that we have to start all over again with the demos and resistance, the campaigns and arguments, to roll back this huge and ultimately destructive assault on our civil liberties. That is not going to cut it. The police are armed like Japanese manga characters, and have powers to lock you up indefinitely should you dare to riot. Once again, BLOGDIAL is way ahead of you. Rioting and demonstrating do not work. They did not work to save the Iraquis (who were murdered to the tune of one million people), and they will not work to restore your liberties. Do you really think that people who are capable of mass murder (Gordon Brown) will be in any way moved by a demonstration or a riot? Are you really that Naïve? In any case, how are you going to organize a resistance when they can know your every move in advance? This is assuming that you will not seek permission for your demonstration or gathering of more than 99 people in advance. You will not be able to surprise the police state with a demonstration or a riot, which in any case, even if you managed to organize it flash mob style, would not produce the result you require; the restoration of your liberties. We need to stop this assault on civil liberties going further, we need to roll back the attritions they have already suffered, and we need a rock solid written constitution to protect us from those who aim to make us all suspects in the gaze of the unblinking universal eye. Wow, you really ARE that Naïve! The United States of America has a written constitution, and it has been summarily torn to shreds by the legislature in the last seven years. A written Constitution is useless against this sort of onslaught. That should be plainly obvious to everyone by now. If you have even a shred of common sense, you should be coming to the conclusion that all bets are off, that something VERY UNCIVIL has to happen if you are going to ever be free again. Thankfully freedom returning to this beautiful island is not impossible. It will take some clear thinking, some twenty first century thinking (combined with some eighteenth) to make this happen. Your freedom is out there, just waiting for you to take it. Are you man enough to take it? If you are not prepared to face these facts, if you are not prepared to stare this problem in the face as you would a leaking roof, then all is lost, and all you and Henry Porter will have are your columns. A flagship database intended to protect every child in the country will be used by police to hunt for evidence of crime in a “shocking” extension of its original purpose, The Daily Telegraph has learned. The �224 million computer system was announced in the wake of the death of Victoria Climbi�, who was abused and then murdered after a string of missed opportunities to intervene by the authorities, as a way to connect the different services dealing with children. However, it has now emerged that police officers, council staff, head teachers, doctors and care workers will use the records to search for evidence of criminality and wrongdoing to help them launch prosecutions against those on the database – even long after they have reached adulthood. It comes amid growing concern about the increasing criminalisation of Britain’s youth and the extent of the country’s surveillance society. Only this week a report warned that teenagers were being dragged into the criminal justice system rather than being given an old-fashioned “ticking-off”, while it has also been disclosed that the DNA profiles of almost 40,000 innocent children are now being kept on the national database. An estimated 330,000 people will have access to the data stored on ContactPoint, which is due to launch this autumn despite fears the Government’s poor record on data security will mean it puts children at risk from paedophiles. Little-noticed guidance published by the Government discloses that ContactPoint users can request administrators to give them archived data for a number of reasons, including “for the prevention or detection of crime” and “for the prosecution of offenders”. ContactPoint will not include detailed case information on children, but will record if they have contact with a Youth Offending Team or “sensitive services” such as drug abuse workers, which critics say will mean it is obvious which young people have criminal records. Baroness Miller, the Liberal Democrats’ home affairs spokesman in the House of Lords, said: “This is truly shocking. It’s exactly the definition of a police state. The police will have the details of a whole generation for so-called crime prevention. Britain has more CCTV cameras than any other country, and its local authorities are increasingly using powers designed to prevent terrorism to spy on people suspected of petty crimes such as littering and failing to pick up dog mess. Ministers are also pressing ahead with a �20 billion scheme to issue all UK residents over the age of 16 with ID cards. The launch of ContactPoint was delayed following the loss of data discs containing 25 million child benefit records by HM Revenue & Customs last year. A review of its security – which the Government refused to publish in full – found the risk of a data breach could never be eliminated. Because of fears that certain children, including those of MPs and celebrities as well as abuse victims, will be at particular risk, a “shield function” has been created within ContactPoint to hide their addresses. However, the new guidance states that this can be overridden if police or social workers deem it an emergency. One of the stated reasons why this may be carried out is “an investigation of a crime toward or by the child”, in a further confirmation of the intended uses of the database. Prof Ross Anderson, an expert in security at Cambridge University, said: “This is yet another revelation about the database state that is shocking but not surprising. A spokesman for the Department for Children, Schools and Families insisted: “The purpose of ContactPoint is not crime detection, it is to help improve services to children, including safeguarding vulnerable children. Shyam Sunder, NIST lead investigator has said that all ‘designers’ (meaning architects) need to revisit their designs to make sure that they cannot fail in the way that he is claiming that WTC-7 Building seven collapsed. This is the greatest error of Shyam Sunder and NIST. Now he is saying that all architects throughout the USA have designed buildings with steel which will now need to be retrofitted because of his false assertion that a fire fueled by office furniture could cause the collapse of an entire steel framed building. If I were an architect, I would be insulted and incandescent with rage at this proclamation. By all means, Shyam Sunder and NIST can concoct any lie they like about WTC-7; that is what they are being paid to do. What they CANNOT do, is say that safety conscious, responsible and professional architects should now re-visit their sound designs at the behest of a liar and his absurd, unscientific and nonsensical assertion. If it is the case that these architects are going to be forced to re-examine their works, this would be a financial disaster for them. No steel framed building would be insurable unless it passes this absurd and bogus WTC-7-NIST certification. No retrofitting would be claimable against insurance, since the architects would have guaranteed their work. The only way they are going to be able to fight this is to band together and then prove that WTC-7 could not have fallen down in the way that ‘Mr. Sham’ Shyam Sunder and NIST said that it did. Their reputations are on the line, and so are their businesses. This is the greatest error that Shyam Sunder could have possibly made. Any architect and engineer with balls isn’t going to take this lying down. If they do, they are in for years of loss making inspections and useless retrofitting. Furthermore, I would like to hear directly from the firm that originally designed WTC-7. Are they really going to take this lying down, NIST saying that their building could not stand the heat generated by burning office furniture?! Finally, after three years, this is the best lie they could come up with. That is simply astonishing, and I have a feeling that Shyam Sunder knows how stupid he sounds. Look at his body language during the press conference. This is the behavior of a man who is lying, and you do not have to be an expert in behavior analysis to see it. Wether you think that 911 was an inside job or not, this explanation of why WTC-7 fell is inadequate. It will make more people suspicious of the rest of the 911 mythology, and will cause architects and engineers everywhere to defend themselves and their work, and by virtue of that action, discredit this explanation. If architects do not get a hold of the original blueprints of WTC-7 and perform their own independent investigation they will have only themselves to blame for the negative effects of this NIST report. Signing a petition demanding that Congress do their work for them (conducting a truly independent investigation) is insane. Here is a comprehensive rebuttal, the first of many no doubt. Can you get drunk on corgettes and blackcurrants? Punters at a village pub have developed an ingenious way of beating the credit crunch without compromising on their daily pint. Thrifty punters have begun bartering home-grown produce in exchange for beer and even pub meals. Various items of fresh fruit, fish, meat and vegetables have been exchanged, with the amount of pints, meals or vouchers offered linked to the size, quantity and quality of the items presented. So far pints have been swapped in place of potatoes, mackerel and a kilo of fresh fruit. Locally shot rabbits, pheasants and pigeons have also been exchanged for beer. 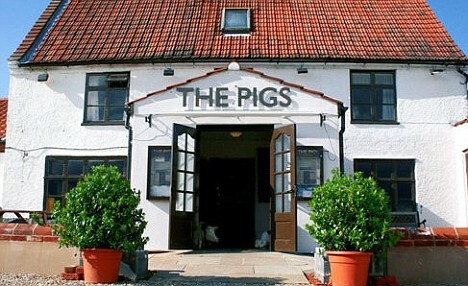 The Pigs pub, in Edgefield, near Holt, Norfolk, even encourages locals to contribute to its traditional food menu in return for free alcohol. Manager Cloe Wasey, 24, said the offer has taken off as people have started to feel the pinch financially. ‘We’ve been doing it for almost two years now but the success of it has only just recently started to boom with the credit crunch setting in,’ she added. ‘People need to find different ways to go out and this helps. ‘It’s also great for us because we get produce at a good price, although we have high standards so the food we get in has to meet those. ‘We find the home grown stuff is often much better than what we can get from the suppliers. Driver Derek Feast, 64, a regular in the pub, recently swapped some of the free range chicken eggs he breeds for a pint. 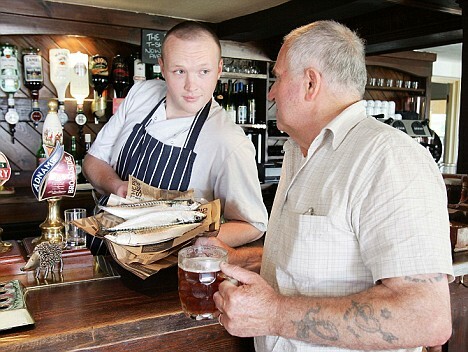 Miss Wasey, who runs the pub with her business partner Tim Abbott, 24, who is head chef, said the scheme has helped cement the pub’s place at the heart of the village community. ‘It gives us a more local feel,’ she said. People without any exposure to the ideas of economics in the abstract understand and are attracted to barter on a gut level. With barter, there is no middle man. There is no VAT, no record of transaction, in short, there is no law involved. Bartercard is unlike any other credit or debit card because you fund our card with your own goods and services…NOT CASH. Bartercard currently helps over 55,000 smart businesses in 12 countries around the world (over 4,000 in the UK) to increase sales, customer base, cash-flow and profit. Bartercard enables member businesses to exchange goods and services with other Member businesses, saving valuable cash, without having to engage in a direct swap of goods. 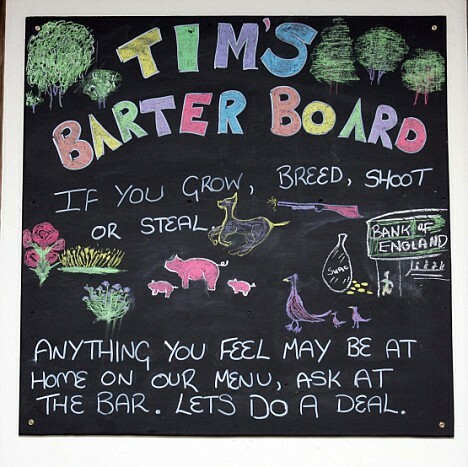 The next step has already been taken; one example can be found in the form of the Totnes Pound, where the idea of barter is pushed into the background and the (more understandable) idea of alternative currency is in the foreground. After this the next step is to create a barter system that works on mobile phones, specifically the iPhone and iPod touch. A barter system running on a mobile platform, exposed to millions of people, could pick up enough momentum to become a powerful alternative to debt based, inflation cursed, corrupt currencies and the organized crime gangs that operate them. PARIS � France’s broadcast authority has banned French channels from airing TV shows aimed at children under 3 years old, to shield them from developmental risks it says television viewing poses at that age. France’s minister for culture and communication, Christine Albanel, issued a “cry of alarm” to parents in June about channels dedicated 24 hours a day to baby-targeted programming. In a newspaper interview, she called them “a danger” and urged parents not to use them to help their children get to sleep. She was referring to two foreign channels that can be seen in France on cable television, BabyFirstTV and Baby TV. The ruling cites health experts as saying that interaction with other people is crucial to early child development. “Television viewing hurts the development of children under 3 years old and poses a certain number of risks, encouraging passivity, slow language acquisition, over-excitedness, troubles with sleep and concentration as well as dependence on screens,” the ruling said. When BabyFirstTV first aired in the United States in 2006, it escalated an already heated national debate. The American Academy of Pediatrics has said babies should be kept away from television altogether. BabyFirstTV and other companies say their products are designed to be watched by babies and parents together in an interactive manner. Critics say such channels are used as a baby sitter. Baby TV is owned by Rupert Murdoch’s News Corp. The three companies behind BabyFirstTV are Regency Enterprises, a film and TV production company that is a partner of News Corp.’s Fox Entertainment; Kardan N.V, an investment group based in the Netherlands and Israel; and Bellco Capital, a private Los Angeles-based investment fund. France controls music with lyrics not in English. Catholic weekly Famiglia Cristiana hit out at the religious values of the Italian government on Monday as the furore over a plan by Interior Minister Roberto Maroni to fingerprint all children in the country’s gypsy camps rumbled on. “The ‘Catholic’ ministers of Silvio Berlusconi’s government have fallen at the first hurdle, without appeal,” said the weekly, which slammed the newly formed government in April for failing to include staunch Catholics in its line-up. “The dignity of man is worth nothing to them. No-one has raised his hand to counter Maroni and his indecent racist proposal“. The weekly went on to attack the granddaughter of Fascist dictator Benito Mussolini, Alessandra Mussolini, who had previously failed to comment on Maroni’s plan despite her recent appointment as president of the Parliamentary Children’s Committee. “Mussolini’s silence is not surprising, since ethnic and religious registers are part of her family DNA and finally return as government heritage“, it said. The Catholic paper went on to suggest that the fingerprints of parliamentarians and their children should be taken first. “We would have given more credit to the minister if, together with the register, he had explained how he would get all the Roma children into schools and take them away from the camps they share with rats. What help has he planned? Nothing”. Mussolini described the editorial as “a mixture of confusion and intolerance”, adding that she “could not fail” to support a plan that would “save and defend” the Roma children. But the president of the Italian branch of the United Nations’ Children’s Fund (UNICEF) echoed Famiglia Cristiana’s fears. “Not only do we fail to understand how this register can bring positive results, but there is a risk of criminalising the victims – the children themselves,” said Vincenzo Spadafora, appealing for a meeting with Maroni. “I think the minister would do well to open dialogue on this issue rather than repeating his position,” he added. A former Italian president, Francesco Cossiga, added to the chorus of nay-sayers, asking what Maroni had planned next. “I think the minister’s next step will be to cut the first phalange from the little finger of the right or left hand of gypsy children, or even better a piece of the lobe from the right or left ear so that they can be immediately recognised,” he said. But Maroni’s proposal received support from Foreign Affairs Minister Franco Frattini, despite unofficial comments from the EC last week that the plan would be unacceptable. “I think that Maroni has done well to continue along this path. This measure is above all in the interests of the children who have no identity. We can help them (by removing them) from the ignoble state of abandonment in which they find themselves,” said Frattini, a former European Commissioner for Justice and Security. “It’s not about registers or anything like that but about identifying those who live in our country. These things are done in many other European countries without any scandal and they will also be done here,” he added. Maroni hit back at critics, describing his plan as a “logical measure” that conformed to European directives. “All the polemics are unfounded, the fruit of ignorance or ideological prejudice,” he said. Maroni also pointed to an EU law passed in April that requires member states to take the fingerprints from migrant minors coming from outside the EU from the age of six and up. Under Maroni’s proposal, fingerprints will be taken during a census of all gypsy camps in a bid to establish who is in the country legally and who is not. Gypsies found without the correct paperwork will be expelled after three months. The government eventually plans to dismantle all illegal camps as well as authorised camps that do not have adequate facilities. The proposal has come under heavy fire from opposition politicians, children’s rights organisations, Catholic immigration foundation Migrantes and international bodies including the European Union and the Council of Europe for discriminating against an ethnic minority. Well well well; it seems like the Catholics are finally smelling the stench of fascism and are beginning to say something about it. Note how Franco Frattini, Fascist, justifies dehumanizing people because it is a logical measure. how can you identify who should or should not be in the country without keeping a register of who is legal? The whole ‘logic’ of fingerprinting and biometrics is that you keep a permanent register and then constantly check people against it. If this man does not understand this, he is incompetent. If he does understand it and said those words, he is a liar. Either way, he has no place being in charge of any of this. Translation: “other states violate peoples rights, and so we will also”. Italy would be far better off simply rounding up all Roma and expelling them en-masse, as they bulldoze their camps. That way, the people of Italy will be spared the creation of their own police state biometric apparatus; which is the REAL reason why this is being done. Once the apparatus is in place, ‘logic’ will be used to justify putting all Italians in the database, and using it for any and all purposes. This is how they build these systems. This is how the Germans built their early computer driven police state apparatus; on the back of the threat of the Baader Meinhof gang. Wake up Italians; you may not like the Roma, but your problem is not them, it is what is being planned for YOU! 1.1.1 There is wide agreement about the outcomes we all want for every child � they should be healthy, stay safe, enjoy and achieve, make a positive contribution and achieve economic wellbeing. That is completely wrong. There is no ‘wide agreement about the outcomes that we want for every child’. That is why millions of families are home educating. There is no ‘we’ in all of this. Each family is separate, and there is no collective ownership of children. Any normal parent wants their child to, “be healthy, stay safe, enjoy and achieve”. The shape that that takes is up to each family, and has nothing to do with and cannot be defined by the state. None of this is negotiable. The same goes for ‘economic well-being’ this is not something that can be defined by the state, especially when it concerns future economic well-being. And for an idea of what a country looks like where everyone has a degree, just look at third world countries where there are so many people with them that many of them are bus conductors. No parent wants their child to be a bus conductor, and yet, if everyone in the country achieved a university degree, would not this eventually be the case? But I digress. Everything in this document (except the database references) would be acceptable if all mention of home education was removed. Home education is not relevant to this in any way, and if this document was designed to guide Local Authorities for all cases of bad children or children at risk (which home educated children are not a subset of) then it would be fairly innocuous. Sadly, the imbeciles who authored this are clearly against home education and have, from the outset, wanted to create a system of organized harassment to suppress home education in the UK. As I have said before, no one in a Local Authority has the right to tell a parent what is or is not ‘suitable education’ anyone with even a single brain cell can see that this is the case. A parent may want their children educated and nurtured in their culture and religion; no Local Authority Apparatchik has the right to come into your house and tell you that your child must receive facts deemed by the state to be necessary to life. The very idea should be anathema to all decent people. 1.1.4 Children not receiving a suitable education are clearly at risk of a range of negative outcomes that could have long term damaging consequences for their life chances. For example they are at risk of not attaining the skills and qualifications they need to succeed in life, and are at significant risk of becoming NEET (not in education, employment or training) once they have reached the compulsory school leaving age. They are also are more likely to be vulnerable in one way or another. They may be from disadvantaged families, (experiencing multiple risks such as poverty, substance misuse, mental ill-health and poor housing), travelling communities, immigrant families, be unaccompanied asylum seeking or trafficked children, or be at risk of neglect or abuse or disengaged from education. The schools that the state runs produce negative outcomes that have long term damaging consequences for the life chances of British children. That is why so many people choose to home educate. Many state educated children do not attain the skills and qualifications they need to succeed in life. The system is so bad that they have to reduce the difficulty of exams so that these educationally impoverished children have a chance of getting a ‘passing’ grade. This is why universities and commercial enterprises have to set their own exams to see who can do what after 100 candidates all with 5 grade ‘A’ A-Levels come to interview but none of them can spell. Disadvantaged families, families in poverty, substance abusers, mental health cases, travelers, immigrant families, asylum seekers, trafficked children – none of these categories have anything whatsoever to do with home educated children, and it is illogical and offensive to mention them in the same breath as the unfortunates in that list. The Local Authorities already have many duties related to these groups. They cannot run the schools they are already tasked with organizing. New Labour ministers avoid them like the plague; what is it that they fear so much about home educators that they must lump them in with these trouble cases? This is a direct attack on a philosophical difference that home educators have with the collectivists in New Labour. New Labour does not want any child left behind…from the indoctrination and brainwashing that creates mindless drones who will believe anything that they are told, who cannot think at all, never mind think for themselves. ‘By their fruits ye shall know them’; look at the results of the schools they have been running. They produced a generation of people capable of enjoying ‘Lad Mags’, an epidemic of binge alcoholism, feral street children and decent people fleeing their ‘education’ system. 1.1.5 Local authorities, through their Children�s Trust, must have robust measures in place both to identify quickly when a child is not receiving a suitable education, and to follow through with effective tracking and enquiry systems. These measures should be at the heart of the local strategies for preventing negative outcomes for children and young people, and ensuring their safety and well-being. The best way to ensure that children do not have ‘negative outcomes’ is to make the schools that they attend good enough to achieve these results. When they are able to make the schools perform properly, the incentive to home educate will be eliminated, and the only people left doing it will be those with children who have special needs. Until they have done this, they do not have a leg to stand on on this front, quite apart from the moral aspect of a parent’s right to educate and nurture their children in whatever way they see fit. 1.2.1 This document is issued under the section 436A (inserted before section 437 in Chapter 2, Part 6 of the Education Act 1996 (school attendance) by the Education and Inspections Act 2006), which provides that local authorities must have regard to statutory guidance issued by the Secretary of State. This document provides that statutory guidance and applies to England only. Local authorities in England must take this guidance into account and, if they decide to depart from it, have clear reasons for doing so. What this means is what I asserted before. These guidelines are not new law, they are guidelines, and as such, you are free to ignore them, just as the Local Authorities are free to ignore them. 1.2.2 This document is a revised version of original statutory guidance issued in February 2007, updated to place implementation of the duty in the revised strategic context following on from publication of the Children�s Plan (December 2007); to reflect priorities that emerged since the original version was published; and to reflect local authorities� initial experience of implementing the duty. 1.2.3 Section 436A requires all local authorities to make arrangements to enable them to establish (so far as it is possible to do so) the identities of children residing in their area who are not receiving a suitable education. In relation to children, by �suitable education� we mean efficient full-time education suitable to her/his age, ability and aptitude and to any special educational needs the child may have. And here is the true purpose of this entire exercise. This is the way they are going to get every child in England into and justify the existence of ContactPoint. Quite apart from that, this section is absurd on its face. It is not the place of the state to determine what is or is not a suitable education. It is not the place of the state to say what is or is not an efficient education, and neither is it their place to mandate full-time education. 1.2.4 The duty applies in relation to children of compulsory school age who are not on a school roll, and who are not receiving a suitable education otherwise than being at school, for example, at home, privately, or in alternative provision. 6.19 When the named person(s) receive notification about a child believed to be in their area it may be necessary to check the child�s name and other details, if available, against all alternative provision rolls in the local area held by the local authority and schools to see if they are already registered. One way to achieve this is to have all names of school-aged children kept on a central database which is frequently updated and can be checked by the staff members who require access. (This is not a requirement to set up new IT systems for children not receiving education. See paragraph 6.37 for suggestions for utilising existing databases). 6.20 Another way to check a child�s name and other details would be via communication links with all educational providers: this includes all schools; Pupil Referral Units; custodial institutions and other providers of alternative provision (local authorities and schools should establish a contractual agreement that providers of alternative provision will keep a register to check if the child is registered with them. God help you if your child has the same name as another child who is a bad egg deep in the system. All it will take is for one of these Apparatchiks to misidentify you and your life will be turned into a living hell. If you let them. They are actually saying that PRIVATE schools must turn over the rolls of their students to the Local Authority. It simply beggars belief, but it is totally logical; they want EVERY CHILD IN THE DATABASE, and being able to afford private education is not going to be an exception. 1.2.5 In order to help local authorities achieve consistency in how they share information in order to meet this duty, this version of the guidance includes, at Appendix 1, a workbook that provides standard data definitions. The data definitions were produced taking into account the views of local authorities based on their experience of implementing the duty since its introduction in February 2007. 1.2.7 Local authorities have a duty to make arrangements to enable them to establish whether a child who is being educated at home (under section 7 of the Education Act 1997) is not receiving suitable education. This is perhaps the worst part of all, and it is something we have covered at length. No public servant has the right or the ability to say what is or is not a suitable education, and by including this in the guidelines, they are opening the door for widespread harassment and abuse. Once again, for many parents the lack of provision of a suitable education by the Local Authority is the very reason why parents are opting to home educate. It is completely absurd that they should now be given guidelines that say they should pass judgement on families when they are manifestly incapable of providing themselves what they are looking for in a home educator. What this boils down to is mandatory inspection. And if you do not measure up, you can be compelled to send your child to receive an inferior education. 1.2.8 ContactPoint, to be implemented across England by mid 2009, will help local authorities discharge the duty by recording the place where a child is being educated, where that is known. Where it is known that a child is being educated at home, that would also be recorded. This will enable local authorities to focus their efforts on identifying children who are not receiving education, and putting in place the necessary support. ContactPoint will also show whether a Common Assessment Framework has been undertaken with a child, and whether the child has a �lead professional� co-ordinating any support required. And there you have it. They are going to use ContactPoint to list all home educators and then pick them off one by one for inspection and shut-down. This section is completely absurd. It says that where a child is being EDUCATED at home, ContactPoint will enable Local Authorities to find children who are NOT BEING EDUCATED! 1.3.2 The duty to identify children not receiving a suitable education can make a cross-cutting contribution to a number of local priorities and should strengthen and complement existing duties. It should be incorporated into the local authority�s Children�s Trust governance and strategic planning arrangements, which are made under section 17 of the Children Act 2004, and the cross-cutting arrangements of safeguarding and inter-agency co-operation to improve the well-being of children. (Children Act 2004 Guidance http://www.everychildmatters.gov.uk/strategy/guidance/). There may also be others, depending on local circumstances. 1.3.4 Information Sharing Guidance was published April 2006 and can be found on the Every Child Matters website. No doubt sensitive data from ContactPoint will be shared with all of these agencies. 6.24 Local authorities should not make �blanket� enquires (by email or hard copy). Contacting all local authorities with a list of children asking them to search their databases is seen as poor practice and the majority of local authorities will ignore this request, as it is time consuming with little reward (very rare that they find the child in their area). It is also not secure. Best practice is for local authorities to carry out thorough local checks in their own authority area before contacting�specific local authorities that they believe to be linked to the child/young person�that they are looking for. Amazing. Fishing expeditions are ‘seen’ as poor practice, they are not ACTUALLY poor practice, and, “don’t bother doing it anyway, since your request will probably be ignored”. Well, I feel so much better that these goons are concerned about security! Of course, we know that ContactPoint itself is not secure, and here, we can see an example of why that is the case. They are going to share information on every child they can get their hands on, between all agencies with a computer, and Local Authorities will be able to search private and public databases at will for any child that they cannot find in their own databases. This is going to be one of the leakiest databases ever…and it will be a database of CHILDREN! If recent entry to UK – their country of origin. This is absurd. First, they want to check every home educator to make sure that the provision is ‘suitable’, and then, they want to make sure that information is ‘evidence based’. You cannot have it both ways; you cannot on the one hand lump all home educators in one basket and say that they are all putting their children at risk based on no evidence at all and then say that information should be factual and evidence based. In the law, you are guilty until proven innocent. You cannot enter someone’s house or data or communications without probable cause. These guidelines violate some of the most important principles of the law and of free countries, this is quite apart from violating the sanctity and centrality of the family. You see? Suspicion is generated by the mere fact that parents are home educators. Unacceptable! 6.34 Local authorities should keep a record of children who are known to be educated at home by parents. Parents are not, however, required to inform the local authority if they decide to home educate a child who has not previously attended school. This is insane. Local Authorities need to keep a record of all home schoolers (why?) but parents are not required to inform the local authority. How are the Local Authority going to keep records of all home educators, as the guidelines say they must? Any self respecting parent will not offer up their children to this system, and so when the Local Authority come calling and the parent says nothing (as is their absolute right), a conflict will occur. This is bad guidance, and like the last set of guidance that ignored all the consultation entries, it is full of contradictions, prejudice, ignorance and offensive, immoral twaddle. One thing is for sure; these guidelines will only affect the most vulnerable home educating families – the ones without money or influence, the ones who are debilitated by having children with problems. Any parent with a powerful solicitor can simply have a single letter written and these Apparatchiks will be frightened off. These new guidelines are offensive. They are offensive because they illogical, and do not take the reality of home and state education into account. They do not take the needs of children into account. They do not take the rights of parents into account. They recklessly and violently violate the privacy of parents and children, and then share their sensitive and private data with anyone they care to, without the consent of anyone. These guidelines are what we expected; another step in the incrementalist approach to total control and outlawing of home education in the uk. Another interesting aspect of this is related to the German home educators experience of their Hitler written home education law (its completely banned). Germans wishing to home educate have moved to the UK and even to Iran to live freely. When the state finally decides to outlaw home education here, will they deny parents the right to move out of the country? Will it be the case in the future that everyone needs an exit visa to leave the UK? Just as it is in Germany and as I said before, if all of this is genuinely being done for the good of the children, how cold you possibly let them leave the fatherland to be educated outside of the German system in Iran, or Britain or the USA? Logically, you would have to bar all movements of all children out of the country so that you can ensure that they are receiving a suitable education in the state system. Under ideal circumstances, we would never be confronted by Local Authority guidelines like this, or the sinister databases or anything else in this wretched document. In a a slightly less than ideal world, we would expect to see a union of all home educators in the UK to combine as a single voice to say that these guidelines are moot and will not under any circumstances be obeyed. There would be a fighting fund, the most powerful lawyers hired, a hell of a stink raised and the state humiliated and sent packing. Sadly, we live in the worst of all possible worlds; there are many home educators who will feel that all of this is perfectly OK, who will go along with it and who will deride anyone who thinks otherwise. We have Local Authorities and government bodies that are completely and willfully ignorant about and hostile to home schooling, who will do anything to stamp it out and will hurt any number of children that they can in order to achieve their nefarious goals. This document is literally sickening. Every aspect of it is nauseating and what is most insulting is the fact that no matter who complains and no matter what logic is applied to it, it will be published as written, without change, because the evil people behind it (and some of the dimwitted on the receiving end of it) simply do not care about anyone’s rights. Another nail in the coffin of Great Britain. Read all our other posts on this subject. “Saakashvili, the great ‘democrat,’ is busy charging anyone who opposes him with being a pawn of the Russians (and therefore guilty of treason), but the West is calling on him to restore civil liberties � and, in an apparent effort to propitiate his Western benefactors, he has lifted some restrictions and called new elections. Widespread and growing opposition to his strong-arm tactics, even among many of his former supporters, spells political trouble for Saakashvili and his corrupt cohorts, however � and an appeal to Georgian ultra-nationalism (which was always the real ideological motivation of the Rose Revolutionaries) would bolster him in the polls and provide a much-needed distraction, at least from the ruling party’s point of view.” What’s particularly disgusting is the spectacle of the fraudulent Saakashvili’s smug mug all over Western television � the BBC and Bloomberg, for starters � invoking his great love of “democracy” and “freedom” and calling on the U.S. to intervene in the name of supposedly shared “values.” What drivel! Up until very recently, Saakashvili has been busy rounding up his political opponents and charging them with espionage, as his police beat demonstrators in the streets. When this happened, even our somnolent media sat up and took notice, but they seem to have forgotten. Which is precisely what has occurred. The United States is denouncing the Russians as aggressors in the UN Security Council and accusing the Kremlin of engaging in a policy of “regime change,” in Ambassador Khalilzad’s phrase. The Russian response: “regime change” is “an American invention,” but, hey, in Saakashvili’s case, it might not be such a bad idea. They have a point. The Georgian strongman is a thug and an opportunist who does an excellent imitation of George W. Bush-times-10: whereas GWB merely implies his political opponents are traitors to the nation, Saakashvili comes right out and says it � then drags them into court on trumped up charges of high treason. GWB has presided over a regime that has legalized torture, but only for foreign “terrorists” (Jos� Padilla excepted). Saakashvili, on the other hand, throws his domestic political opponents � whom he labels “terrorists” � in jail and tortures his own countrymen. Georgia’s notorious prisons are chock full of political dissidents. GWB justifies his aggression by invoking “democracy” and the doctrine of “preemption,” while Saakashvili doesn’t bother with such theoretical niceties, denying his aggression against South Ossetia in defiance of the plain facts. GWB recently assured Saakashvili that he would do his best to get the Georgians into NATO, but the Europeans � particularly the Germans � are balking, and this foray by the Georgian Napoleon into a direct conflict with the Russians seems to confirm their initial reluctance. The Euros are no dummies: they know Saakashvili’s recklessness could plunge the entire region into an armed conflict that would resemble World War I in its utter stupidity. I’ve written at length about the economic and political interests that stand to profit from a war in the Caucasus, and I won’t repeat myself here except to note that the timing of this � with attacking Iran on the War Party’s agenda � should alert us to the importance of what is happening. Russia has not only been opposed to Iran’s victimization at the hands of the West, but Putin and his successor have taken up Tehran’s cause, selling arms and technology to the Iranians and running diplomatic interference on their behalf. This is Washington’s counterattack by proxy. Please don’t tell me Saakashvili just woke up one day and decided to attack Ossetia, and that the Americans weren’t notified well in advance. Georgia depends on U.S. military and economic aid, and Saakashvili is a savvy operator: he is pulling a Lebanon, having learned from the Israeli example, and the Bush administration is more than glad to oblige him. Georgian tanks would never have rolled into South Ossetia without being given a green light by Washington. Georgia has embarked on a very dangerous course, and it’s important to realize it hasn’t done so alone. Saakashvili has the implicit backing of Washington in his quest to re-conquer the “lost” provinces of Ossetia and Abkhazia (and don’t forget Adjaria!) � or else what are 1,000 U.S. troops doing engaged in “joint military exercises” with the Georgian military, just as the crisis reaches a crescendo of violence? (The Brits, to their credit, have thought better of getting dragged into this one�) It’s too bad Obama is going along with the game plan, but then again, he was never good on the Russian question to begin with, so I can’t say I’m disappointed. South Ossetia is not now a part of “sovereign Georgian territory,” and it hasn’t been for nearly two decades, no matter what McCain and Obama would have us believe. If they, along with GWB, are going to stand by Saakashvili’s side as he mows down civilians and imposes martial law on a war-torn, dirt-poor, and much-abused people, then may they all be damned to hell � that is, if we can find a rung low enough for them. It’s funny � if you like your humor black � but when Slobodan Milosevic was supposedly doing to Kosovo what Saakashvili is now doing to South Ossetia, the U.S. launched bombing raids and “liberated” the Kosovars from what we were told was to be a gruesome fate. There are many reasons to doubt that this attempted “genocide” ever took place, but given that something very bad was going on in the former Yugoslavia, one has to ask: why don’t the same standards apply to South Ossetia? I’ll tell you why: because the victims, this time, are Russians, Slavs who haven’t achieved official victim status in the lexicon of Western “humanitarians.” Imagine if, say, Colombia invaded Panama, and rained bombs down on the many U.S. citizens currently living there. Would the U.S. act to ensure their safety? You betcha! So somebody please tell me why Russia hasn’t the right to defend its own citizens, and even to deter and punish Georgian aggression. The War Party has been running on some pretty low energy lately, and this revival of the Cold War will no doubt recharge its batteries. The warmongers need a new enemy, a fresh face in their rogues’ gallery, to get the masses excited again, and Putin’s Russia fits the bill. I’ve been warning of this possibility for what seems like years, and now the moment is upon us. What’s interesting is how many left-liberal “peaceniks” are falling for the War Party’s guff and lining up behind McCain, their hero Obama, and the neocons in the march to confrontation with the Kremlin. In a single, concise, citation laden article, Justin Raimondo proves that he is a Blogger Without Peer™. This is the sort of writing that I like to read, and is the sort of writing that everyone needs to read. And while you are at it, take a look at this tirbal map of Georgia and the surrounding region. When you look at a map of the disputed area and then see a map like this, you start to get a real picture of what is actually going on there. The modern NHS is all about choice, so we are told.� Let me give you an anonymised real example of How NHS Choice REALLY Works: a child has an undiagnosed problem, it takes 3 trips to the childs GP before the child is offered a referral to a specialist hospital clinic. 1. A letter is sent out explaining the ‘choices’: You can book your appointment online, or by phone! 2. When booking (via your choice of method) you are offered the choice of hospital X or …er, thats it. 3. You are offered the choice of date X at time Y or …. er, thats it. From April 2008, if your GP advises you that you need to see a specialist, you can choose to go to any hospital in England, including many private and independent sector hospitals. You can choose the hospital with the best reputation or shortest waiting times, or simply the one that is most convenient for you. The NHS repeatedly says patient choice is guided by the availability of information (see links above). A study which raised the possibility that MMR was linked to autism has since been dismissed by the vast majority of research, but levels of public confidence in the jab have still not fully recovered. The government has launched a campaign to raise MMR vaccination rates in England amid growing concerns about a measles epidemic. The Department of Health has asked primary care trusts (PCTs) to offer the jab to all children up to the age of 18 not already fully protected. Extra vaccine supplies and funding are being made available. An epidemic of measles – which can be fatal – could potentially affect up to 100,000 young people in England alone. Experts say it is perfectly safe, but vaccination rates dipped following controversy about its safety. This propaganda campaign follows similar localised efforts, similarly reported as ‘news’ by BBQ. The aim of the Department of Health here is to increase uptake of vaccination. Would it not be simple, instead of trying to scare people into giving MMR to their children, to offer single vaccinations against each disease. To offer, perhaps, a choice. Instead NeuLiebour are offering the choice (devised by the MP in charge of the party’s health manifesto for the next election) of ‘vaccinate or be excluded from school‘. Whether its about forced vaccination, ID cards, security theatre, data protection… soon the choice will be yours. The other night, I listened to the great Alex Jones, who complained rightly and bitterly that his websites are ‘on a government blacklist’, making them inaccessible on the free wireless network at St Pancras Station. thinkprogress.org is also blocked as are many others. These websites are not blocked in China, “public enemy number one” when it comes to web censorship so we are told. I decided to see for myself what the precise details of this blocking are, and made a few google searches and phone calls. St Pancras Wi-Fi is run by a company called ‘CitySpace‘. This is the press release announcing the contract from 2007. I telephoned CitySpace, and asked wether or not there is a blacklist on the St Pancras station Wi-Fi. I spoke to a polite man who told me without any hesitation that the people who run St Pancras requested that the service be flittered, and that the list of sites to be blocked comes from a company that provides the blocking software, “it’s an off the shelf product” is how he described it. He said that he would find out all the details for me and then let me know the who and what and where. St Pancras Station is run by London & Continental Stations and Properties. London & Continental Railways (LCR) is a railway company based in the United Kingdom. Created at the time of the Privatisation of British Rail it bid for and won the contract from the UK government in 1996 to build and operate High Speed 1 between London and the Channel Tunnel. As part of this deal the European Passenger Services (EPS) and Union Railways sections of British Rail were handed over to LCR as well as key pieces of railway infrastructure including St Pancras railway station and Manchester International & North Pole depots. EPS was the British arm of the joint Eurostar operation, along with SNCF and NMBS/SNCB. LCR renamed EPS as Eurostar (U.K.) Ltd. (EUKL). Union Railways had been developing plans for HS1 since before the opening of the Channel Tunnel and continued this role as part of LCR. The original shareholders of LCR were National Express Group, Virgin Group, SBC Warburg, Bechtel and London Electric. As part of the 1996 contract LCR were to finance and construct the Channel Tunnel Rail Link (CTRL) themselves, funding it from income received from the Eurostar operation. In 1998 LCR ran into major financial difficulties and appealed to the UK government for support. It admitted that income from its share of the Eurostar operation was not at the level it expected and would therefore not be able to undertake construction of HS1. At this time the future of the high speed line looked in doubt. See here for more details. In 2006 LCR put forward a proposal to build a domestic high speed line north of London � see High-speed rail in the United Kingdom. Operation of the line will be undertaken by Network Rail under a contract lasting until 2086, when LCR’s concession ends too, and all rights return to the British Government. Now what we have to hear is which ‘off the shelf product’ is being used as the filter list. I will update this post tomorrow. I the mean time, if you ever find yourself in St Pancras or any other place where the internetz are blocked in some way, like a public library, you can get around the censorship very easily. There is no excuse for passively accepting censorship in the age of the internets, and it is up to you to be active, computer literate, and to know the tools you are using so you can free the information that you require for yourself. Install Stealthy for your browser. It should display the IP you are using as your proxy and not the IP your ISP allocated to you. I spoke to CitySpace today, to the same person I spoke to originally. He told me that he conferred with people in CitySpace, and they said that, “it was not for them to confirm this” and that “I would have to speak to St Pancras about it. There are 25 people in blue coats at St Pancras to answer these sorts of questions”. I said, “so there are 25 COMPUTER LITERATE people in blue coats who are able to tell me what blocking software is being used to filter their Wi-Fi network? I think we both know that is highly unlikely!” He agreed. I thanked him and hung up. On to St Pancras, phoned them, got the reception, passed to some upper guy, transferred up again, spoke to a woman, who said, “they took advice that certain websites should be blocked. I said, “well I would like to know who gave you that advice”. She then said that she would look into it, and that this is a service that just recently went live and that if there are things that are blocked that should not be they would need to look into that, and that if members of the public call them to comment on the service they would look into how it is working. She said that if I call her tomorrow morning, she should have some answers for me. I spoke to the woman at St Pancras who told me to call her today. She said that she had spoken to someone about this, and that she had not been given the information, but she was told to give me the mobile number of a person who did have the information. They are running an off the shelf software product. St Pancras, has direct control over the list, and can block and unblock any site. They have a review system, whereby people can appeal to have their site unblocked. They then take a decision to keep a site blocked or to unblock it. They will do this on a case by case basis, and in order to make an appeal, a site owner should contact Media at St Pancras. They were advised by “independent third parties” as to what shape the provision of the free Wi-Fi should take. It is possible that certain political websites may be “caught up in the trawl” of blocked sites. He refused to say who provided this list of blocked sites, or who the vendor of the software was. That last call was the longest of all, taking the total time of all the calls to around 55 minutes. The fact of the matter is (and this is me talking) that St Pancras free Wi-Fi is a private network, and as such, they can block whatever they like on it. They are under no obligation to provide access to anything whatsoever, and if you want free and unfettered internet access, you have to retain and use the skills and tools that are freely available to you to make the magic happen. If you rely on the providers of train stations and rail services or anyone other than a pure ISP to connect you with the internet, then you are submitting to the prejudices, ignorance, guidelines and the ‘third party advice’ that govern their networks. It is up to you to find out how things really work and then take the appropriate steps so that your experience is unfiltered. Think about it this way; if a publisher rejected an advertisement you wanted to publish, you wouldn’t think you have a right to have it displayed in their newspaper or magazine? You absolutely do not have a right to be published in anyone’s magazine, and you also do not have a right to have your content re-transmitted over someone’s private network. You DO have the right to publish what you want, and to distribute it to whoever you like…its up to you to make sure that your content is deliverable. In the past, this meant finding a distributor to get your content to the shops. Now it means making sure that your readers and listeners are well versed in proxy tools so that no matter where they are, they will always be able to connect to you. You do not even have to write the software to do this yourself. There are toolbars and addons out there that make getting around censorship as simple as a single click of a button. The distinction between a private and public network, between private and public space, is very important, and many people have a blurry / fuzzy idea in their heads about what these concepts actually encompass. Censorship in China, which is by the GOVERNMENT and censorship of a PRIVATE WI-FI NETWORK are two different things; it is the difference between self censorship and censorship from above that covers everything everywhere. If what I have been told is true, then this is a case of the former; even if the people who offer the software are a government front, and even if the ‘independent third parties’ are compromised in some way, St Pancras have the final say and fine grained control on what is blocked. This is fundamentally different to China blocking everything at the network level. Could someone telephone them and tell them to keep certain sites blocked? Of course. But all of this is moot if you are able to use your computer to get around blocking software, which is why it is so important to spread information about how to get around filtering with tools like TOR and setting proxies. You can expect more and more filtering on private networks that are accessible to the public. The people who run these private networks are not interested in providing access to everything, will actively suppress ‘inaccurate information on blogs’, swallow wholesale the advice of third parties, will deploy banning lists provided to them by third parties unquestioned, see no value in the free flow of information, and in the case of St Pancras specifically, do not think much about it as they are more interested in running trains on time. They feel they are doing you a favor (and really, this is correct) by letting you have access to anything at all for free in the first place; they make no money out of it, it has nothing to do with trains and it means they have to employ people to bluster about their service when something isn’t right. Another common and effective strategy to limit exposure to Internet content is by encouraging self-censorship both in browsing habits and in choosing content to post online. This may take place through the threat of legal action, the promotion of social norms, or informal methods of intimidation. Arrest and detention related to Internet offenses, or on unrelated charges, have been used in many instances to induce compliance with Internet content restrictions. In many cases, the content restrictions are neither spoken nor written. The perception that the government is engaged in the surveillance and monitoring of Internet activity, whether accurate or not, provides another strong incentive to avoid posting material or visiting sites that might draw the attention of authorities. The tests also raise serious questions about the Government�s �4 billion identity card scheme, which relies on the same biometric technology. ID cards are expected to contain similar microchips that will store up to 50 pieces of personal and biometric information about their holders. Last night Dominic Grieve, the Shadow Home Secretary, called on ministers to take urgent action to remedy the security flaws discovered by The Times. �It is of deep concern that the technology underpinning a key part of the UK�s security can be compromised so easily,� he said. The ability to clone chips leaves travellers vulnerable to identity theft when they surrender their passports at hotels or car rental companies. Criminals in the back office could read the chips and clone them. The original passport holder�s name and date of birth could be left on the fake chip, with the picture, fingerprints and other biometric data of a criminal client added. The criminal could then travel the world using the stolen identity and the original passport holder would be none the wiser. Furthermore, the thief could selectively replace the fingerprints and photo to make the most convincing fake ever. This is something that no one seems to understand; you can replace entries either in the database or the ‘cloned’ documents so that someone can most convincingly ‘become you’. We have been saying all of this for years, and we have gone further, with more accuracy and prescience. The fact of the matter is, no matter what anyone says, a database can never be ‘secured’ and no ‘urgent action to remedy the security flaws’ can ever protect these systems. Take the central passport administration computer offline, so that it is only accessible from inside a single site. Issue passports in line with our system, ISLAND. If any document is issued correctly, and is not tampered with, it must be assumed that the holder is the person named on the document, whether it has biometric information in it or not. If the document has been tampered with, then the holder might not be the person named in the passport. This is the only type of check that needs to be made in passports. Biometrics are not needed to ensure that the holder of a passport is the named person in the passport. Certainly, there is no need for a central database of all biometrics (photograph, fingerprint, iris scan) to check the identity of each person every time a passport is used. A simple test to see if the passport has been tampered with is all that is required. Each passport or ID document contains a cryptographically signed digital portrait of the holder, signed by the passport issuing authority. The digital signature of the passport photo is also downloaded. A PGP-like signature check is done against the public key of the national passport issuing authority, which is stored on the keyring of the swiping device. If the signature is good, the document is genuine. If the signature is bad, the document is a forgery. This system does several things. It decentralizes the management of photo authentication. It stops the inevitable abuses of centralized databases. Each passport photo is digitally unique. This means that every time that you get your photo taken for your passport, it is a different cryptographically signed number that ends up in your passport. You will never have a unique identifier tied to your identity, even though its your face in every photograph. Big brother gets a kick in the balls. Passport/ID fraud is basically eliminated, except for the fake ones made to order at the request of MI6 and the like. There is no need for the centralized passport biometrics database that they are planning; the means exist right now, with military grade crypto and digitally signed photographs that will create a rock solid, absolutely authenticatable, user friendly, non big brother solution to passport fraud, that protects documents and does not further erase our rights as free people. The crypto to do this is in the public domain, and so zero-cost license wise. My solution is cheaper than the centrally held database solution. Now of course, there is nothing to stop people from collecting these signature numbers, but if that is the only part of the passport that is readable, and this readable part does not contain your name or any other personally identifiable information, it will be harder for people to create a database connected to your biometric ID. If you are the nervous type you could change your id every month; in any case, I devised this ID scheme to demonstrate that there is no reason to create a centralized database from the outset. There are other, better ways to manage document authenticity. All someone has to do is simply THINK about the problem. Unfortunately, the people who are behind the deployment of this disaster are the companies that sell the systems that will be used to fleece the population for decades to come. Money is the true root cause for centralization, that and the lust for absolute control that slobbering pigs like David Blindkid and John Asscroft dreamed about. It is only a matter of time now, before both RFID passports and ID Cards are scrapped. They are not only perfect examples of the misapplication of technology, but they are immoral, illiberal, ineffective, not cost effective and socially corrosive. I just heard (at 10:08AM) two air raid siren test bursts, lasting approximately twenty seconds each, here in South West London. The council knows nothing about it, “very strange” they say, and, “there is no emergency going on right now, otherwise we would have been flashed immediately”. I have never heard such a test being carried out, and neither has anyone else who has lived here (some for decades). …encourage(s) children to sign up as “climate cops” and keep “climate crime case files” on their families, friends and neighbours. The ads, run by Npower, promote a website at www.climatecops.com where “trainees” must complete three missions before they can join the “elite cadets” and “train to become a climate cop”. These missions basically consist of a barrage of eco propaganda which the child must simply engage in in order to be accepted as a special agent of the green brigade. 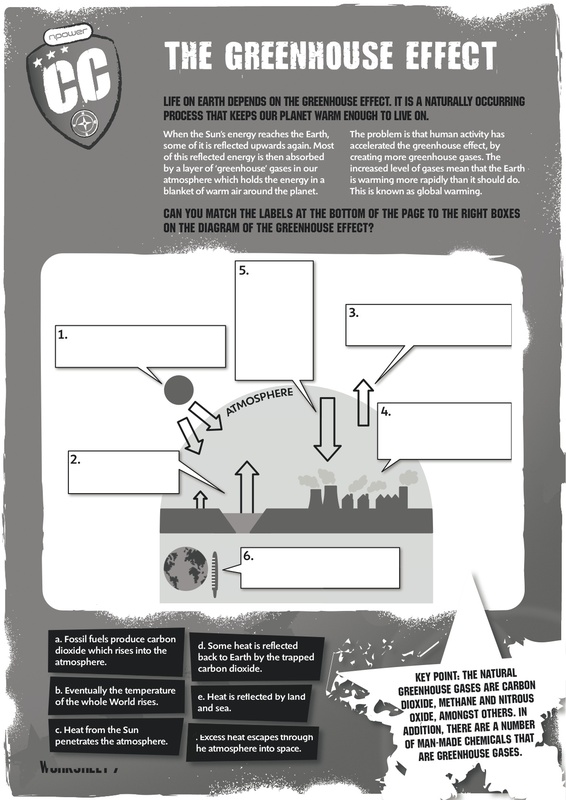 The site offers a selection of downloads, including a pack of �climate crime cards�, which instruct recruits to spy on families, friends and relatives, encouraging each of them to build up a written �climate crime case file�. 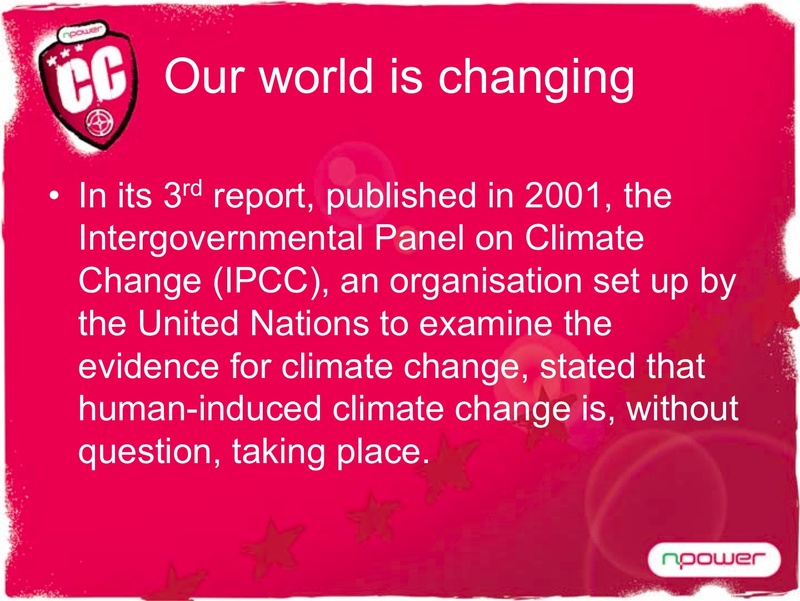 I surfed over to the Climate Cops website, played some of the dreadful Flash games, and read some of the propaganda. Its all as described by Infowars; pure Orwellian propaganda, junk science and brainwashing. What piqued my interest was the offer of a ‘teaching pack’ available for the asking. So I asked. The smell of ink and solvents from this package was very strong, as you can imagine. This is an extraordinarily wasteful product, completely unnecessary in the age of the internets, which also asks teachers to print out materials for their students wasting toner and even more paper once this paper bomb arrives at its target. Now, lets go into some of the detail of what is printed in this appalling package. 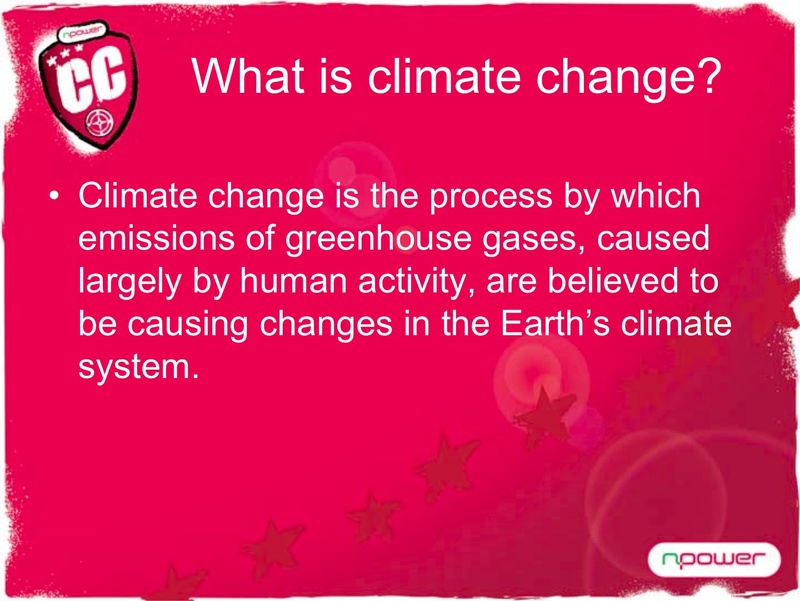 This teaching resource uses PowerPoint presentations and games to guide the student into believing Global Warming propaganda. It leaves out a staggering amount of science, uses gutter street talk in an attempt to appeal to the illiterate student, and is a transparent and foul instrument of deception. Lets take lesson 3 as an example. The fourth item is the one that is interesting to us; to do it, they use a series of lies and glaring omissions. Lets take a look at one or two. The first glaring omission. Nowhere in this pack is the carbon life cycle mentioned. There is no mention of photosynthesis, or the fact that plants convert CO2 to O2. There is no chemistry, only the most dumbed down talking points. The word ‘plant’ does not appear in the worksheets and related materials; the phrase ‘tree planting’ appears once, in the Sustainable Development slideshow (PDF), which is given as the answer to the question, “2) List three examples of carbon offsetting”. The phrase tree planting is left by itself, without any explanation of why it would work to ameliorate the ‘problem’. Of course this answer is in the context of the plan to measure everyone’s ‘carbon footprint’ the pretext and basis for world wide taxation and micro-management of every aspect of life. The astonishingly over-simplified diagram in the centre makes no mention of the plant life of the earth that absorbs the very gas that these liars say is causing all the problem. Why? Because the schoolchildren will instantly conclude that if plants absorb greenhouse gas (CO2), then all we have to do is plant like crazy to solve the problem. Every pre idiocracy schoolboy knows about the carbon life cycle. By leaving out the truth about the carbon life cycle of the earth (a lie of omission) they are disarming these hapless students, removing their ability to argue logically about this subject. I think you get the gist of all this. It is nauseating propaganda for the educationally submnormal. “My house is proper old; and it is not insulated or double-glazed”. That is the sort of English in this pack. That is the ‘thinking’. Of course, Etonians and Hone Schoolers will not be subjected to this garbage; the latter may do so only to demonstrate how utterly stupid the masses are, and how they are being corralled like pigs into the squeeze chutes….but I digress. Finally, lets look at a particularly odius section. *This activity is speculative. It is not currently possible to provide concrete scientific evidence to suggest that climate change is responsible for any of these events. I wonder how many people would not bother to read the disclaimer, or who would read it and dismiss it. The sort of children who are spoken to with phrases like ‘Our house is proper old’ are not the fine print reading sort. The propaganda push for the Global Warming hoax is still going strong. They are repeating the same discredited lies over and over, and what is worse, they are recruiting an army of Orwellian snoops to enforce the new and completely insane regulations, so that everyone goes around with unwashed clothes, unwashed bodies, no fun, no freedom and a standard of living so reduced as to render this and the other technologically advanced countries unrecognizable to its citizens that will remember what life used to (and should) be like. Of course, none of this needs to happen; what is for sure, is that the way out will not come from the classrooms where this propaganda is being spread. * I loathe writing�that contains sentences that begin with the word “so” don’t you?